I am Andrew Ryan, and I’m here to ask you a question. Is a man not entitled to the sweat of his brow? “No,” says the man in Washington, “it belongs to the poor.” “No,” says the man in the Vatican, “it belongs to God.” “No,” says the man in Moscow, “it belongs to everyone.” I rejected those answers; instead, I chose something different. I chose the impossible. I chose… Rapture. A city where the artist would not fear the censor; where the scientist would not be bound by petty morality; where the great would not be constrained by the small! And with the sweat of your brow, Rapture can become your city as well. Not just a computer game that features politics, BioShock’s political viewpoint powers the game. Spoilers follow for BioShock’s story! At its heart, BioShock is a first-person shooter, heavy on sci-fi horror, and light on RPG elements with upgradeable weapons and abilities. Set in 1960, the game takes place in the underwater art deco city of Rapture, built by tycoon Andrew Ryan to be a paradise of free enterprise, but since degenerated into a nightmare world of murderous mutants. 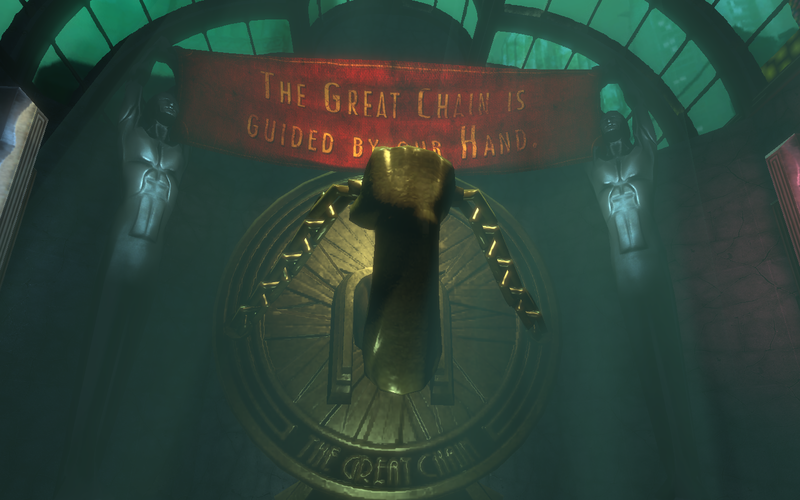 From the start, BioShock is overtly political. The inspired intro sequence, with the player delivered by bathysphere to Rapture while Ryan explains his philosophy, tees up what will be revealed once you arrive. BioShock’s lead designer Ken Levine drew on political ideas, including concepts of utopia and dystopia, in particular the work of Ayn Rand and Objectivism. In fact, BioShock has Objectivism squarely in its sights, and lands blow after blow with relentless accuracy. The architect of Rapture is industrialist Andrew Ryan, disillusioned by government interference, driven by his brand of ideologically pure laissez-faire capitalism. Ryan is a true believer. 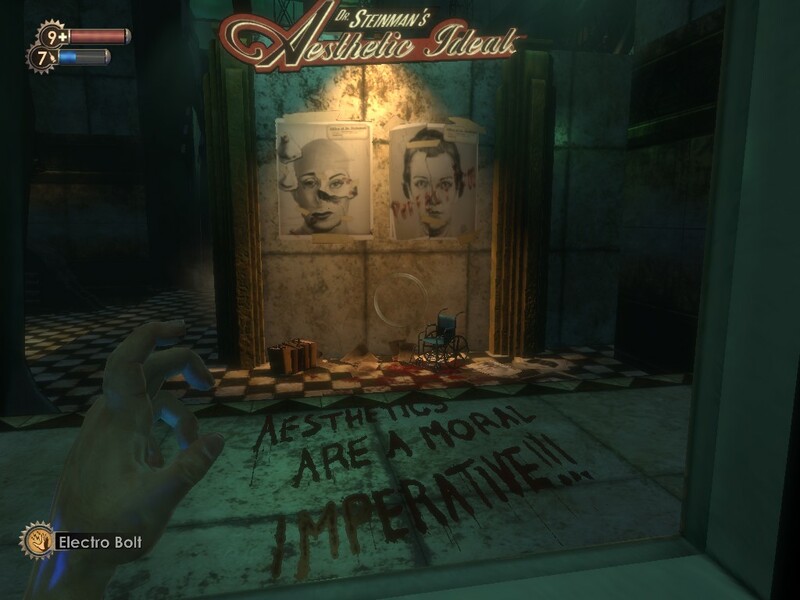 Rapture was founded on his faith in the “Great Chain” – BioShock’s take on Adam Smith’s “invisible hand”. There’s a direct line between Andrew Ryan’s refusal to regulate plasmids – dangerous gene-altering serums – and Rapture’s collapse. 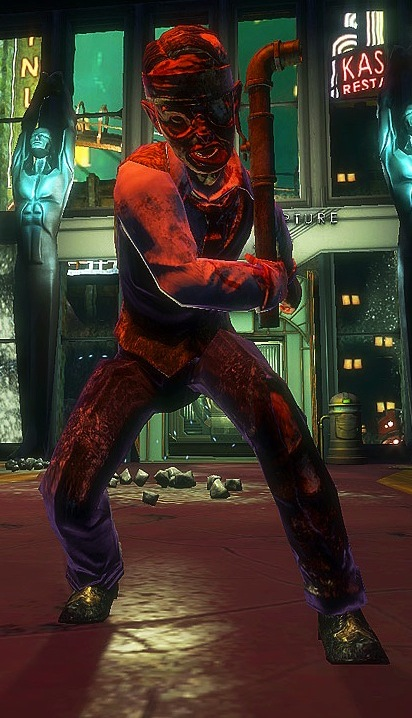 Splicers are the end result: the main bad guys of BioShock are the disfigured, insane remnants of genetically modified humanity. On the surface, I once bought a forest. The parasites claimed that the land belonged to God, and demanded that I establish a public park there. Why? So the rabble could stand slack-jawed under the canopy and pretend that it was paradise earned. When Congress moved to nationalize my forest, I burnt it to the ground. God did not plant the seeds of this Arcadia; I did. BioShock shows up Ryan’s ideology as not just solipsistic and self-regarding, but also greedy, grasping, resentful, and contemptuous of humankind. As a takedown of Objectivism and libertarian ideas, BioShock is not content to make a general statement. In each level the game examines the theme from a different angle. Andrew Ryan declares Rapture a city “where the scientist would not be bound by petty morality”. But without legislation or ethics as a guide, Ryan’s libertarian dream causes the world of medicine to go mad. With genetic modifications, beauty is no longer a goal, or even a virtue; it is a moral obligation. Do we force the healthy to live with the contagious? Do we mix the criminal with the law-abiding? Then why are the plain allowed to mingle with the fair?! Without rules, anything goes in the city of Rapture. BioShock’s precision targeting of the weak points in Ryan’s belief set go further. The laissez-faire system of unfettered free enterprise is a bold idea. But like all bold ideologies, it’s great only in theory. Not even a titan of industry like Andrew Ryan could make it work. More than that, he corrupted the purity of his own “utopia”. Jim: Hey, Mary. Everything okay? Mary: Did you hear that Andrew Ryan took control of Fontaine Futuristics?! I’m hopping mad! Jim: Slow down there, little lady. Mary: Sorry, Jim, but I’m real upset. We came to Rapture to get away from government muscling in on private business people. Jim: Sure thing, Mary. But Andrew Ryan didn’t “take control” of anything. The government council just assumed stewardship of Fontaine Futuristics until all of Frank Fontaine’s crimes and betrayals against the people of Rapture are sorted out. Pretty soon, everything will be back to normal! Mary: Really? Well, that’s a weight off my shoulders! Jim: Remember, Mary— doubting the Council only emboldens the bandits! Some capitalist! Funny how the rules change and ideologies bend – when it suits. Any number of tyrants have done the same throughout history, and found people willing to believe their contortions. There are other hints of the Ryan regime’s crackdown. Whether it’s smugglers, engineers, artists, ordinary citizens – all were crushed under the weight of the Great Chain. Further spoiler warning about BioShock’s story and characters! In dire circumstances, the impoverished citizens of Rapture turn to Atlas, hero of the common man (and the player’s ally). But while Andrew Ryan keeps the faith, Atlas – revealed in the game’s twist to be Ryan’s business rival Frank Fontaine – is a hardened cynic and con artist. Made Ryan good and mad when I started playing the charity angle. Fontaine’s Home for the Poor. ‘Fore I knew it, I was calling myself Atlas and leading an army. Ryan and his precious Rapture. You don’t have to build a city to make people worship you… just make the chumps believe they’re worth a nickel. Fontaine exploits the blindspots of a system that has left people behind. He plays on their “economic anxiety”. But only in a ruined world like Rapture could a fake populist like Atlas rise to power. Right? Fontaine is the voice of the forgotten man who is really just another grifter picking the pockets of working people. Ryan is the libertarian, anti-government capitalist who happens to nationalize industries and suppress the media. Squeezed between these two failed, twisted visions are the remains of Rapture’s humanity. It’s pretty grim stuff, but the designers of BioShock depict their dystopian vision perfectly. 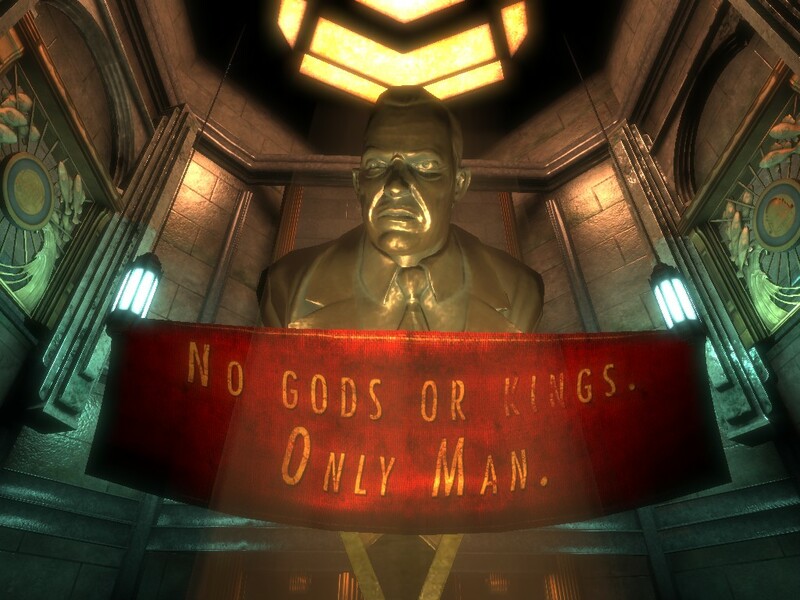 BioShock is a biting satire of Ayn Rand, Objectivism, and the libertarian fantasy of drowning government. The game turns Atlas Shrugged on its head. BioShock blends compelling gameplay and an incisive story to make a political point. Get your politics out of my video games? Sorry, but BioShock came out in 2007, and is as timely as ever. Ken Levine and the designers tell a story about the fallacy of blind worship of the market, and the destructiveness of power for power’s sake. A thorough, devastating critique, BioShock is as effective a rebuttal to libertarianism as you’ll ever experience. BioShock was heavy handed on the political commentary, and it’s narratives like that which seem very reflective for current times. Ryan’s vision and the results from it in Rapture shows what happens with an unregulated market. A lot of those free enterprise folks are always up in arms about government “interference,” and lord knows no government is perfect, but letting those in power run amok with no regulatory body, essentially trampling all of those who don’t have the ability to stand against them is just as terrible. Ryan really was no different than a corrupt government all to himself. 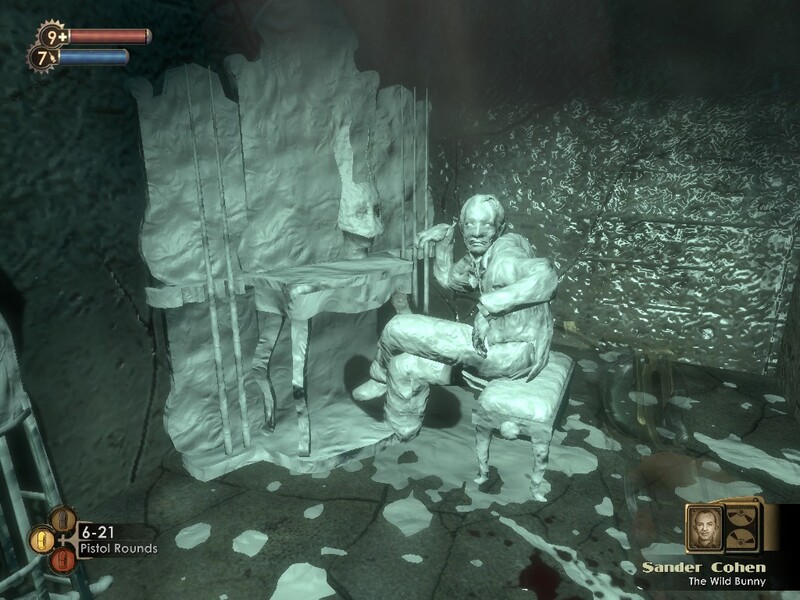 I enjoyed BioShock. It had similar motifs to Final Fantasy VII, which is my favorite story, with the same ideas around people in power doing horrible and unethical things (or allowing horrible and unethical things) to happen to those unable to protect themselves. Thank you! I’ve (still) never played Final Fantasy VII, so will need to check this out – really interested now that you mention it has similar themes to BioShock. The capitalism overrun/corporate government is a definite similarity. Also the lack of bioethics. I had actually just finished watching SOMA when I saw BioShock, but though they share similarities with the dwelling under the sea, there are huge differences in atmosphere. I liked the message BioShock had. It was really well presented.